Ghanaian Internet sensation Jake Amo. Photo taken by Carlos Cortes and shared on Instagram by Solomon Adufah. It all started with a photo. In it, a young boy named Jake Amo is drawing with intense focus during creative studies and art at his school in the village of Asempanaye in Ghana. The class was run by Solomon Adufah, a Ghanaian, who is studying fine arts at the University of Illinois in the United States. 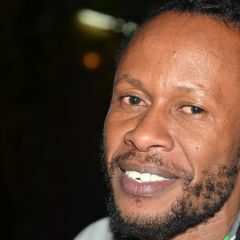 The picture was taken in August 2015 by his friend Carlos Cortes, who was documenting Adufah’s journey to Ghana. Adufah shared the photo on his Instagram page in January 2016. The snapshot then became an Internet sensation in September and October 2016. It is believed that this was after South African Internet users remixed the photo into funny memes such as this and this. “When they ask you to write down your past job experiences & you're writing you were an admin of Facebook page & whatsApp group”. 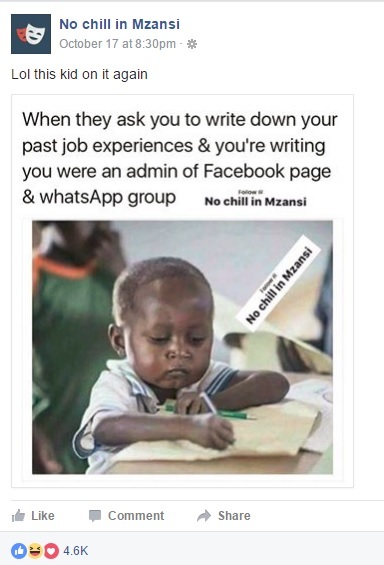 Screenshot from No chill in Mzansi” Facebook group. 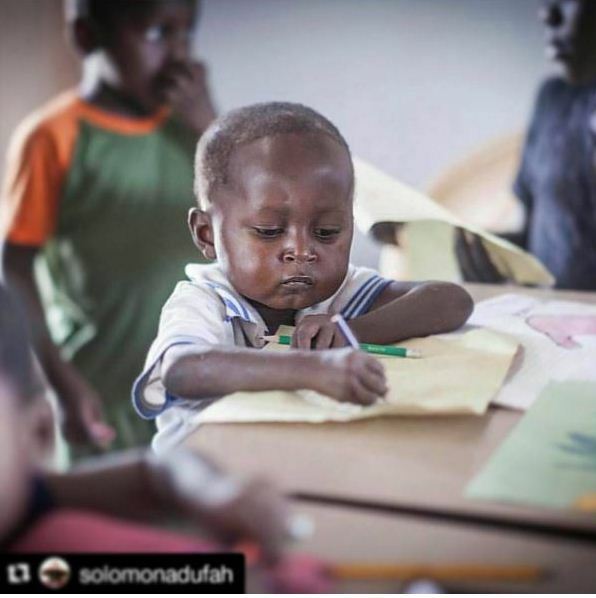 Solomon Adufah has turned the now iconic image of Jake into a crowdfunding initiative to support him and other children like him in Ghana. On its 12th day, the campaign had so far raised over $12,000 from over 500 donors.